We’ve been reading and learning about the sun lately. It seemed like a fitting subject to learn about during the summer. 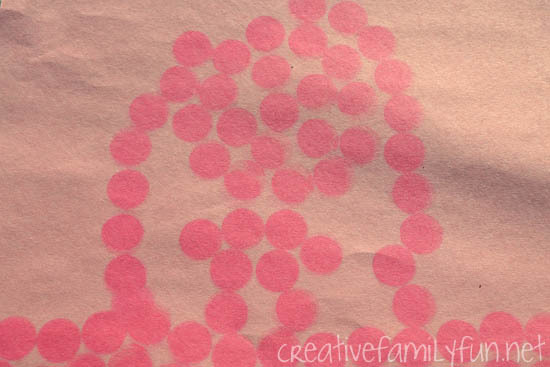 While thinking about some things we could do I remembered making sun prints when I was a kid. It was an easy and fascinating project; one that was perfect for a summer day. 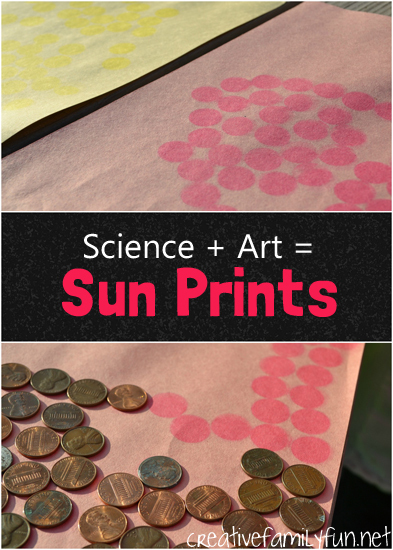 So, we combined a little science with a little art and made sun prints. 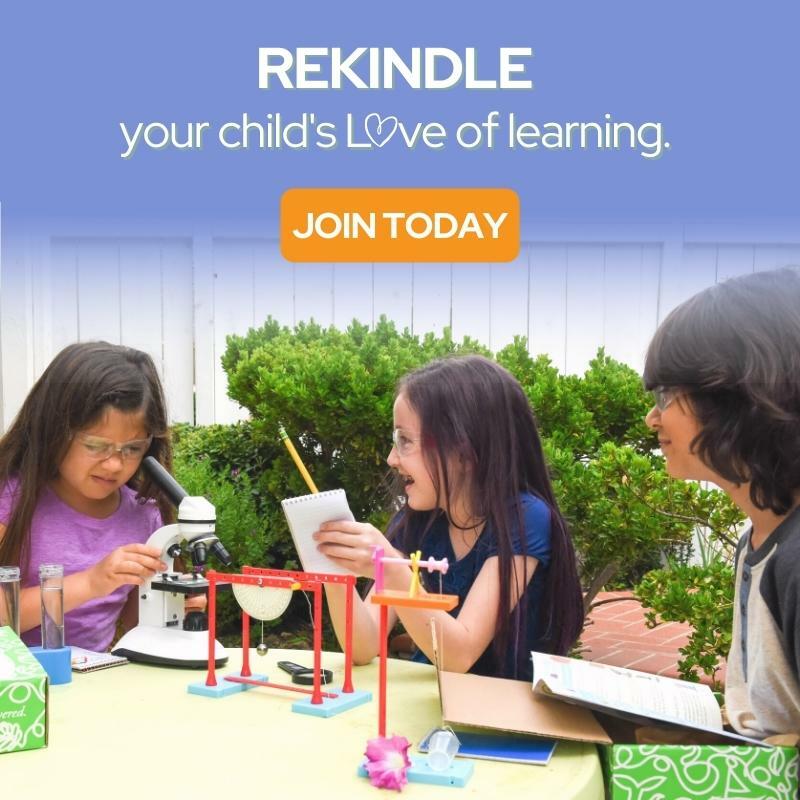 Let’s gather our supplies to do this fun STEM project. Find a nice sunny spot to work on your project. 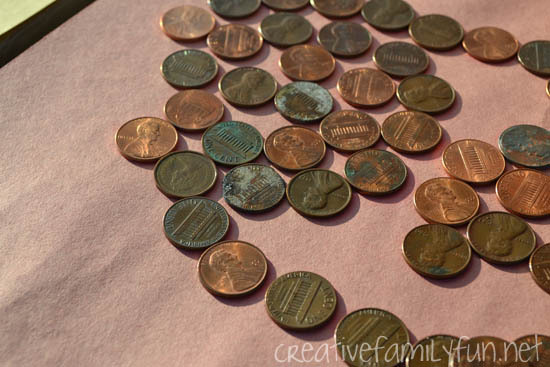 Once you’ve arranged your coins, you will not want to move your paper until your project is complete, so choose wisely. We chose a spot in our backyard that had sunshine for many hours during the day. If the day is windy, you will want to tape your paper down so that it won’t blow away. We made the mistake of not taping ours down and had to go rescue our pennies halfway through the project. Let me tell you, pennies are hard to find in a grassy lawn! 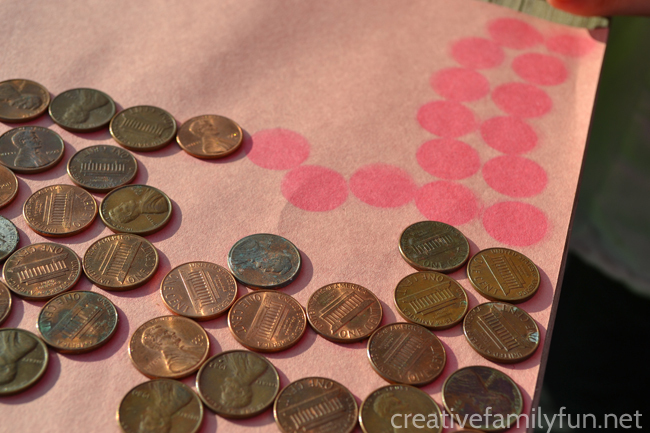 Arrange your pennies in a pretty design on the paper. Then, don’t move them for several hours. Create a pretty design, try to write a word, or make a simple picture. Make some observations along the way. Is your paper getting darker or lighter? 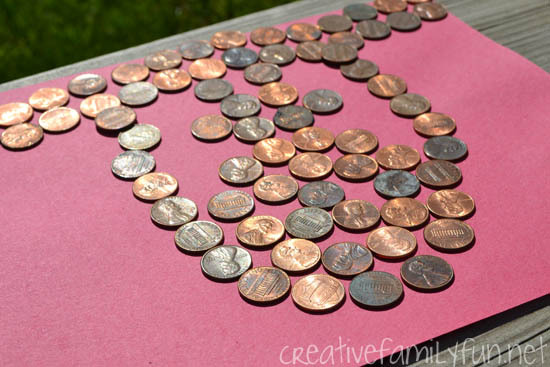 What do you think is happening underneath the pennies? Touch a penny. How does it feel? We left our paper outside for 8 hours. You don’t have to leave it out as long as we did, but the longer the sun shines on your paper, the more contrast you’ll have on your design. The first thing we noticed on our design was that our paper was a lot lighter than when we first brought it out. 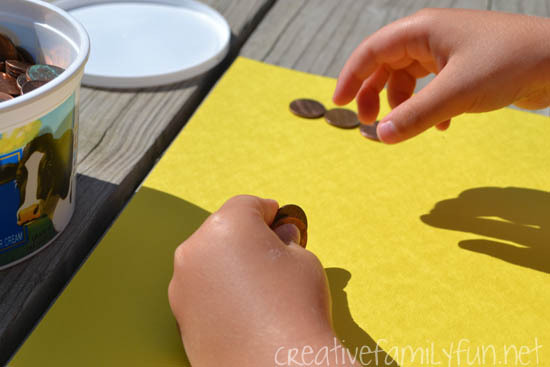 Next we started removing our pennies and saw the design form right before our eyes. The paper underneath stayed dark because the pennies blocked the paper-fading UV rays of the sun, a process described as “really cool” by my girls. Above is a close-up of one of the pictures. If you can’t tell, it’s a girl with long pigtails standing on the ground. 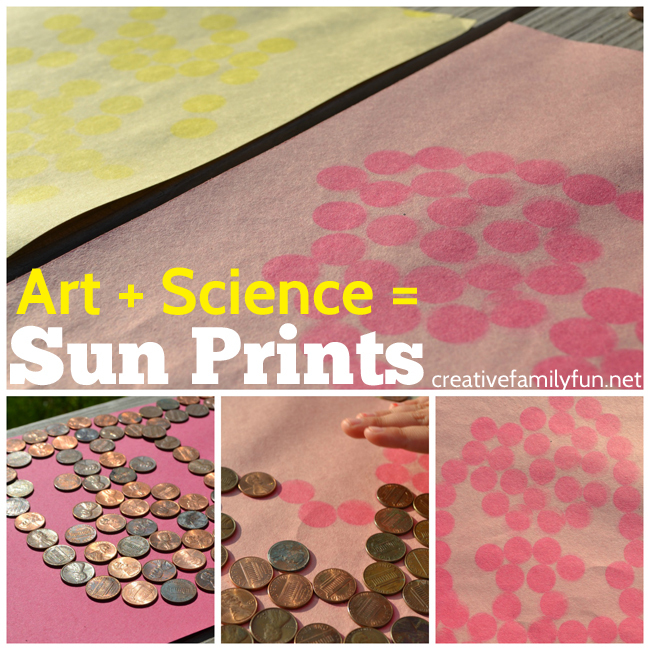 Have you ever made sun prints? It’s a fun experiment to show just how powerful the sun’s rays are.